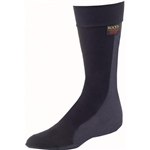 Rocky waterproof Gortex lined crew socks are top notch inclement weather socks to keep your feet dry in any weather conditions. Order by your shoe size. Available in Men's whole sizes 5, 6, 7, 8, 9, 10, 11, 12, 13, and 14. Ladies order 1 size smaller than your shoe size.